No No Yeah Okay (NNYO) is a sonic melting pot of electronic, hip hop, pop, and punk. The band has garnered attention quickly and has even been included in Spotify’s New Music Friday Playlist. Production that includes layered synths perfectly blend and coordinate with these lyrics to create a full sound that is edgy yet irresistible to listen to over and over again. 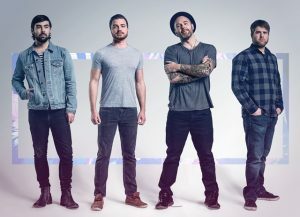 They recently dropped the video for their single, “Make Believe.” You can watch it >>HERE<< The track can be found on their latest EP called “Cabal” that was put out on February 9th. Thanks for your time! Where does this interview find you all today? What is one song that you are loving right now? What is a song that you all disagree about loving right now? Right now, you can find us buried under a foot of Wisconsin snow while dreaming of warmer days. But we are veteran’s at dealing with this, so we’ll survive I guess. What’s cool about us all coming from different musical backgrounds is that we individually discover new music in the places that the other band members wouldn’t think to look. We have a private Spotify playlist that we have loaded songs into to share inspiration with each other… We may need to make that public at some point. I like to think that we do a pretty decent job of being open to everyone’s inspirations and trying to find how we can integrate those styles into the collective sound. 2018 has been busy behind the scenes. We are very active with playing shows and contributing to the local music scene during late Spring to early Fall… but once that temperature drops, we get back in doors and really focus on writing new music. So far, this year, we’ve just been getting together to write new stuff, practicing our set and setting the vision for the summer. Our goal is to get further out of Milwaukee and play for some new audiences in new cities. The band came together kind of strangely. It was a bit of an evolution and discovery; trying to find how the four of us fit together. I think we committed to the idea of being in a band before we were sure we actually worked well together. Once we released a few tracks and were receiving a lot of local attention, I think that’s when we knew we had something. Our name is a story within itself. The skinny is that we branded ourselves a handful of times but either right before we released something or had an announcement, we saw that someone else had the same name or something very similar. When it came to No No Yeah Okay, it was really just an inside joke between us. It just reflects the process of getting four people with super different backgrounds to align on anything. There’s a lot of “No, I don’t like that” before we get somewhere where we all feel comfortable. 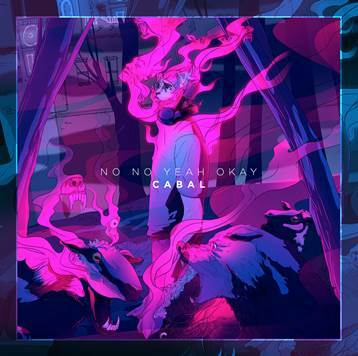 Let’s talk about your newest EP called “Cabal.” What did it feel like to finally put it out into the world? What was it like making this collection of music? Did anything surprise you about the overall process? It’s really exciting to see how far the project has carried and how many people are responding to it. We are the type of group that doesn’t write a lot of songs, but instead we just keep refining one song for a long period of time. So, version one of the songs that are on Cabal sound nothing like the tracks that were actually released. Slower songs turn into dance-focused tracks, choruses become verses, etc. We just keep taking a new look at songs until we’re collectively happy. What was the inspiration for the EP’s lead single “Make Believe”? What was it like making the music video for it? How creatively involved were you all with the making of it? Well the whole project of Cabal surrounds this concept of ‘identity’. How do you identify with yourself, with others, how do you change your identity to fit in, etc. “Make Believe” is a portion of that story. It’s just about someone working really hard to be who they are not, and the struggles that come along with that tension between being who you are and who you want to be. Mark has been a film writer and director for a few years, so he just took it and ran. We had a very narrow timeline to pull it together. It was written, casted, shot, edited, everything in 8 days. We called on the help of some talented collaborators from Milwaukee to craft the video with us. Chris Siegel, Kyle Kadow and Steven Cleavland were the men behind the cameras, and our starring lady, Natalia Taylor, has worked with Mark on several other projects, including another video of ours, “Great Scott”. So far, what do you think has been the most surprising part about this whole musical ride? Do you have any upcoming shows you would like to tell our readers about? The most surprising part is how organic this whole process has been. We never set out to specifically accomplish anything. We just liked getting together and trying to make noises that sounded good. Once we saw that people were taking notice, we made it a conscious effort to take our music from out of our basements and into more public spaces. So far, so good. We do. Like I mentioned before, we really focus our efforts during the winter months on building new tracks, etc. However, we are looking forward to playing a benefit show for the Leukemia and Lymphoma Society. It’s a great event that’s been organized by an extremely motivated local high school student. For us, it’s the first show of the year, a great chance for us to shake off the cobwebs and help with a cause at the same time. After that, we’re looking to get busy during the summer months with more festival shows, local and otherwise. Social media is important to manage, but it doesn’t compete with actually being out in the public and meeting people in real life. We take advice from our label partner, Little Assembly, but we have the freedom to drive our identity how we think fits best (which is how it should be!). We all contribute to social when we can, but Mark largely manages our website, social and other public communications. We love dipping into unfamiliar territory and working with genres we aren’t traditionally associated with. Would love to work with someone like Frank Ocean or with a high-energy group like the A$AP Mob. Musical collaborators aside, I think a dream partnership would be to work with a brand or influencer who focuses on providing really cool experiences for people. Amazing show concepts or film or video games or sports… Something where we can elevate our music from just being songs to something that can help support a really cool experience… Like I’d love to write a play or something scored to NNYO. Yeah, we definitely are. We are all working professionals, some are married, some with kids, and we all take in the world through a different lens. What’s consistent though is that music is a release for us. When we’re in the basement working on music, there is no politically inept global leader having a twitter war surrounding nuclear devastation with North Korea…. So, we keep that to the side and focus on living our lives the way we want to. We take control of that by enjoying ourselves with music and looking forward to the positive influences. What do you hope is the message of your music? What do you hope people continue to take away from your songs? What do you hope they take away from one of your shows? Is there anything else that you would like to share with our readers about yourselves or your music? We just hope that we make music that’s relatable. Obviously, we want it to be enjoyed for its musical nature, but if it helps people think about themselves or their environment differently, then that’s a bonus. When it comes to our shows, we want people to walk away with an understanding of the creativity that goes into the craft. Our stage presence, effects, sonic structure, etc. are all individually a showcase of our different abilities but the blend of them hopefully shows our desire for strong artistic presence.